Wow, it has been a very long time since I wrote a post on here! These cupcakes were so very special, though, that I felt they deserved it. 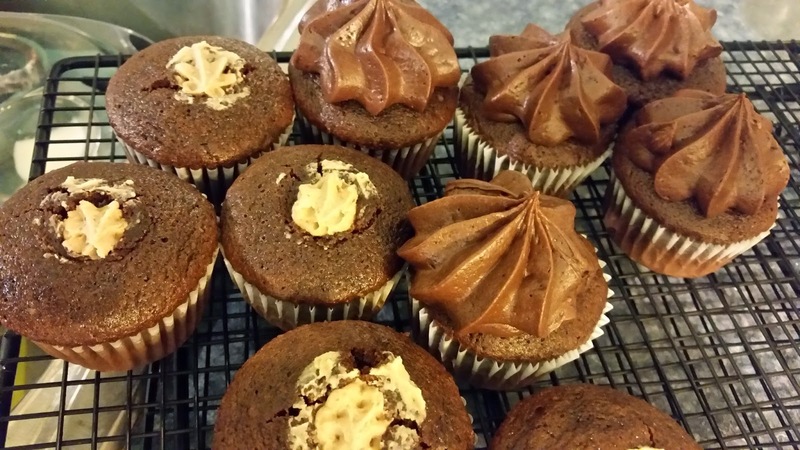 A little boy who was turning 8 wanted cupcakes that were reminiscent of peanut butter cups. Delicious idea! Originally, his mom asked for peanut butter cake with chocolate icing. I decided instead that in order to be more like peanut butter cups, they needed to be chocolate stuffed with peanut butter with more chocolate on top. I made my standard chocolate cupcakes which are not very sweet and generously filled them (pictured above) with a delicious, creamy peanut butter filling. Then they were topped with a sweet chocolate buttercream. They were quite decadent and not for the "I'm not really a sweets person" person. I thought they were just to die for and will be making them again for my father in law's birthday this weekend since he loves peanut butter cups. I felt they really were a great representation of peanut butter cups in cake form. If you like filled cupcakes, try your hand at making them yourself! It's not hard or terribly time consuming. I don't bother cutting a piece out to fill them. You can just stick a tip directly into the cupcake and squeeze gently until they are filled. You will be able to tell by the weight and how the top looks. It will begin to split or crack open if you overfill. You can buy special tips or just try it with a tip that you already have. 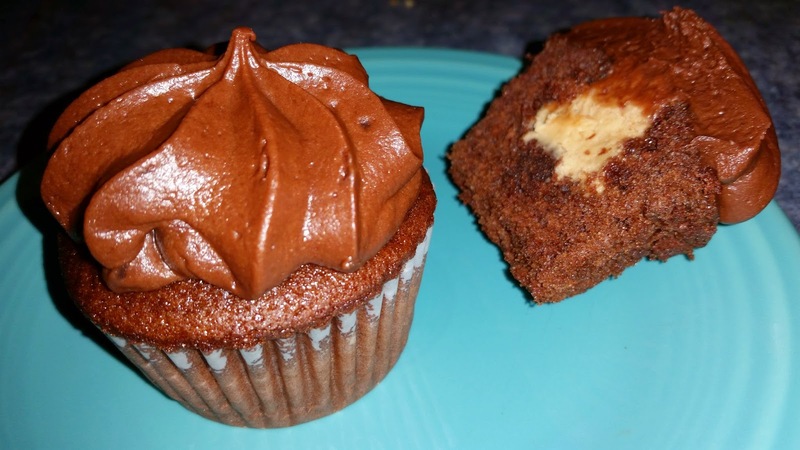 You can fill cupcakes with pretty much anything you'd like and make countless combinations. It's fun and would be a great project with kids! My Christmas cookie order form is ready! Check it out. Thanks! I am so behind on blogging that this is my daughter's 2nd birthday cake. She is turning three in about two weeks! Oh well, better late than never, right!?!? My daughter really loves Tinkerbell and all the other fairies that reside in Pixie Hollow! In fact, up until very recently, she has been saying that she wants a Tinkerbell cake again this year. She has changed her mind, and hopefully I will have her 3rd birthday cake on here before she turns four! I generally do not purchase items to place on cakes. I often prefer to handcraft things instead of plopping some plastic crap on my cakes. However, I was just so enticed by these adorable fairy figures that were actually usable stamps after coming off of the cake that I just could not resist. Plus, I was pregnant, so the easier the better! Of course my daughter was thrilled to get some fun little toys after her cake too, so maybe that plastic crap isn't so bad after all. I did a lot of cutting and stacking with this cake. I believe it was about a full double layer sheet of cake when all was said and done. It was delicious, and my little birthday girl adored her cake. What more could I ask for? Cutting and shaping cakes is a lot easier than it seems. You just need a little practice. Most importantly, make sure that if you plan to cut and stack or sculpt cake that you are working with a sturdy cake. There is nothing worse than trying to do this work with a crumbly cake. You can even buy cakes un-iced at your local bakery or from me to practice! And, I am sure your family and friends will be thrilled to help you get rid of your practice cakes. Wow, it has been quite a long time since I have made a post. My last post was back in July before my third daughter was born. I had three kids 4 and under for about a month until my 4 year old turned 5 in August. Needless to say, I have been super busy not only with the kids, but with baking too! I have a ton of things to post, but I decided to start with this sweet little cake. I made this cake for little girl's first birthday. Her parents are huge fans of chocolate and mint, so I came up with this delicious combination. I started with my regular chocolate cake. I decided to throw some Andes candies chips into the batter. It made the cake slightly minty and extra moist and chocolatey. I didn't want to make the cake too minty/toothpastey, so I decided not to cover the whole cake in mint buttercream. However, I did make a standard buttercream with some mint extract for in between the two layers of cake. I have a recipe for an icing that I call chocolate satin frosting. It is almost like a ganache, but not quite, and it is not super sweet. I thought it would be the perfect pairing for this cake. (Actually, I think it was my hubby's idea.) I used simple fondant numbers and letters with polka dots for the decorations. All in all, I thought this cake looked sweet and was delicious. Even my husband who is not a huge fan of chocolate and mint enjoyed this cake. The National Confectioners Association has declared February 19 "Chocolate Mint Day". So next year on February 19, celebrate with some chocolate mint candies, mint chocolate chip ice cream, or whip up and cake like this for yourself. Or better yet, save yourself the mess, and order one from me! Trifle is one of my very favorite desserts. I love that it is so versatile and so, so delicious! You can pretty much put whatever you want into a trifle. Of course there are traditional English trifles, but you can stray from that very easily! I chose to do a pretty standard trifle. I started with some pound cake that I cubed and soaked in simple syrup. I could eat just that alone!!! So delicious! I also made my standard pastry cream which is such a great recipe to master since it can be used in such a large variety of desserts. I really like trifle with raspberries, but it was a little early in the season to find tasty, reasonably priced raspberries, so I went with strawberries and macerated them for a bit in a small amount of sugar. I did put a little spin on my whipped cream. Instead of stirring in powdered sugar to sweeten the cream, I used brown sugar. The molasses in the brown sugar gave a nice flavor to the dessert as a whole. What is so nice about trifle is that you could use angel food cake instead of pound cake, vanilla pudding instead of pastry cream, or any kind of fruit that you like or that is in season. I particularly like trifle with stone fruits when they are in season! If you aren't much of a baker, you could still throw together a trifle pretty easily. You can buy pre-made angel food cakes at any bakery. You can make a box of vanilla pudding. Choose whatever kind of fruit you like and make or buy some whipped cream. You just layer everything together, and voila, you have a trifle! It's that simple. Use whatever you have on hand or whatever is in season. Just make it your own! I was asked to do a cake with Foofa from Yo Gabba Gabba for a little girl's 3rd birthday. I was excited to design a cute cake, and my kids were equally excited when they saw the Foofa that I created for the first time. Instead of a standard half sheet cake, we went with a 12 inch round cake which feeds approximately the same amount of people. One layer was yellow, the other was chocolate. It was covered in my French buttercream. At first I considered making Foofa out of fondant alone, but that is a bit risky. Sure, she wasn't going to be super huge, but the party was in a park. We have been having some very hot weather here in Pittsburgh, I wasn't sure she would hold up! I could have made her entirely out of gumpaste, but who wants to eat a gumpaste character? So, the night I was going to craft her, I sent my wonderful husband to the store to get some marshmallows and crisp rice cereal. I formed her out of crisp rice cereal treats and covered her with pink fondant. I used gumpaste for the flower on her head because it dries much stiffer than fondant. All in all, I was happy with the cake, and I believe my clients loved it. Although gumpaste may seem like the same thing as fondant, it is very different. Gumpaste dries hard, almost like glass. It will shatter if dropped after it is completely dry. Fondant will get stiffer, but will not harden completely. You would never want to cover a cake with gumpaste. It is really great for delicate flower work, straps for handbags, 3D figures, shoes. It is perfect for something that you want to maintain a specific shape. It requires time to dry as well. I like to let gumpaste decorations dry over night. If you are interested in learning how to decorate with fondant or gumpaste, don't be afraid. Pick some up at the store and play with it like you did with playdoh as a child. It's fun!